Since wrist pain is one of the most common complaints of beginners to yoga, it’s worth exploring the subject. In this article we look at potential causes of wrist pain, ways to prevent it and how to keep up the practice, even when the wrists are sore. We will also illustrate some simple exercises to strengthen and stretch this small joint. In dynamic styles of yoga, there are several, repetitive poses that involve weight bearing through the hands, which isn’t something we often do in our daily activities. The act of bearing weight here also involves a deep extension of the wrist. In poses like all fours and plank, for example, we have the maximum extension through the joint, at a 90 degree angle between the hand and the forearm. This can be very demanding on joints that haven’t moved this far in a long time, and start to lose their natural range of motion. This in itself can make certain asanas (yoga postures) uncomfortable and sometimes painful. Often, the pain isn’t just caused by tight wrists, but with weak ones too. When bearing weight into the hands we must remember to spread the fingers apart, distribute the weight into the entire surface of the hand with every finger pad pressing down, and the knuckles at the base of the fingers pressing into the floor, especially grounding the index finger knuckle. As you move from pose to pose, remember to check your hands placement. Do this until the correct alignment becomes second nature. Maintaining the correct alignment prevents wrist injuries. We should also remember that our wrists aren’t used to bearing all this weight. If they feel over worked or strained during the practice we should respect that and modify. If your wrists are particularly tight, try taking the hands slightly in front of the shoulders, rather than directly under the shoulders, in positions like plank and all fours. Alternatively, make fists with the hands or lower on your forearms. I have made a short video to show you some ideas on how to modify your practice – Watch it here! If you’re not sure how to modify certain poses, ask your teacher. Ensure your speak to the teacher before class so they can explain the modifications to take and see if they work for you. If your wrists are injured or weak they need to be strengthened and stretched before you can safely bear weight. Do wrists curls to strengthen (similar to a biceps curl, but with little or no weight): make a fist with the hand and curl the hand in toward the forearm. Another good way to build strength into the wrists is by squeezing a stress ball. Always remember that yoga is meant to be beneficial and healing, so avoid straining the wrists and be patient. 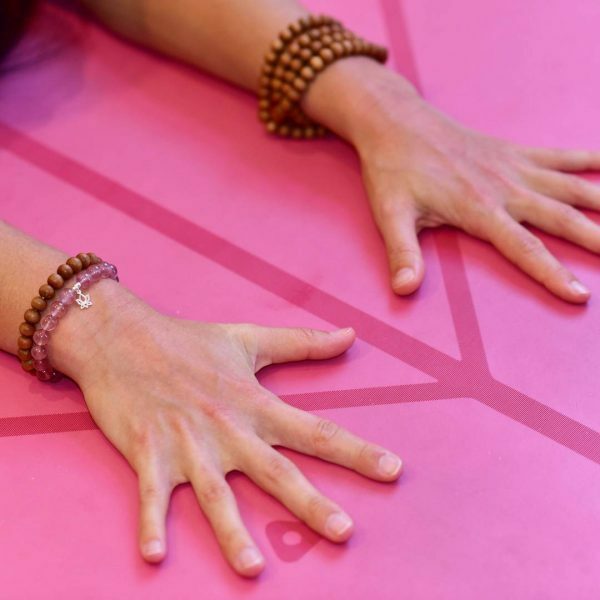 With time your wrists will become strong and flexible enough to support you into a wide range of yoga pose. Even if you need to skip some poses, you’ll continue working on building strength and flexibility in other parts of the body, which may help reduce the load into the wrists with time. Did you know a strong core and strong arms play a part in ensuring we don’t collapse the weight into the wrists when the hands are on the floor? Let me know if you want to hear more on this in a future post! If wrist pain is persistent and severe, speak to a medical professional.